Title page of ‘Quran Sharif’. Over 115-year-old Gurmukhi translation of Quran Sharif, believed to be the “oldest” Punjabi version of the Muslim scripture, has been traced to a village in Punjab. What is interesting about this 784-page volume is that it was translated from Arabic to Gurmukhi by a scholar of the Nirmala tradition, a sect of Sikhism. Hindu businessmen and a Sikh collected money for its printing, a task which was undertaken by an Amritsar-based Sikh publisher. 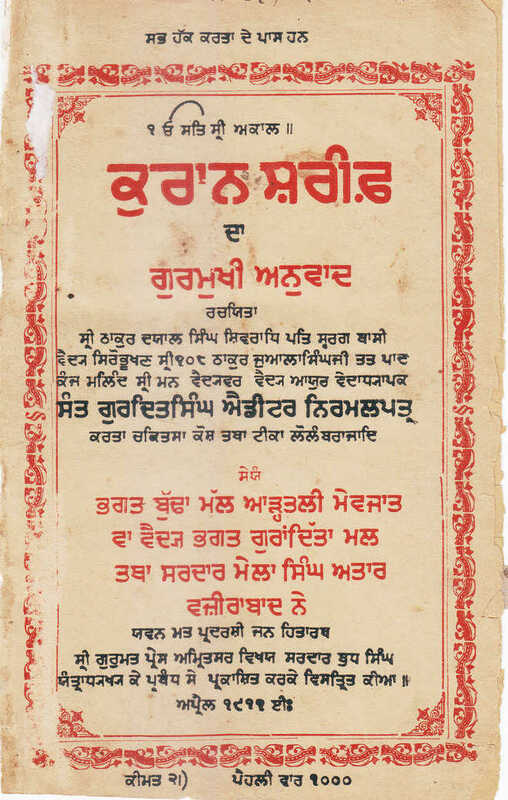 Published in 1911, the edition was recently traced “perchance” to a village in Moga district by Dr Subhash Parihar, art historian and former professor of history at the Central University of Punjab, Bathinda, while he was working on an encyclopaedia on Sufism to be published by Punjabi University, Patiala. It was so far that believed the first Gurmukhi translation of the scripture was done by scholars of the Qadian-based Ahmadiyya sect of the Muslims in the early 1980s. However, the discovery of the 1911 edition has taken many scholars by surprise. “I frequently need to consult the Punjabi version of Quran for research purposes. During a casual discussion on the issue, Noor Mohammad of Lande village of Moga district, told me that one such translation was with him. “When I received a copy, I could not believe that Quran’s translation in Punjabi was done over a century ago. The research that I have done so far has made me believe that it is the oldest Punjabi translation of Quran Sharif”, Dr Parihar said. Dr Parihar said it was translated by Sant Vaidya Gurdit Singh Alomhari, a Nirmala Sikh. Priced at Rs2.25, only 1,000 copies were published. “Its beauty is that its printing was sponsored by two Hindus ­— Bhagat Buddhamal Aadatli and Vaidya Bhagat Guranditta – along with a Sikh, Sardar Mela Singh Attar of Wazirabad, Pakistan. It was published by Sardar Buddh Singh at Shri Gurmat Press, Amritsar”, he said. Till a few years ago, the copy was in possession of poet Jhanda Singh Aarif of Kotkapura. “After Arif’s death, his elder son Natha Singh handed it over to Noor Mohammad. Natha Singh died around six months ago,” Parihar added.